We’ve written before about helping students form positive study habits, and our brain training franchisees are uniquely positioned to help students discover the best way to prepare for a test or a project. However, as we’ve said before, brain training is about more than preparing for an exam – it’s about helping people prepare for the future by improving their cognitive skills and their confidence levels. At LearningRx, we encourage those who own and operate a learning center to work with students of all ages and skill levels. For those in high school and above, it can be beneficial for them not only to have one-on-one tutoring with their brain trainer, but also to join a study group comprised of their peers. This will allow them to learn from those their same age, and also discover how others in their class or school approach certain problems and deal with academic struggles. It also provides them with the opportunity to form lasting friendships! Routine can be an important part of studying, and for those in high school and college, it can be a great way to make sure that everything is completed before the next class or lecture. If a math study group meets every Wednesday night, then each student will know that he or she needs to be prepared for a weekly session. He or she can work on the assignment or have questions written down to bring to the group, and if the class is on Thursdays, everyone will be prepared for any test, quiz, or project that the teacher or professor throws their way. LearningRx always supports building positive relationships, whether it’s between a brain trainer and a student, a franchisee and a parent, or fellow students. 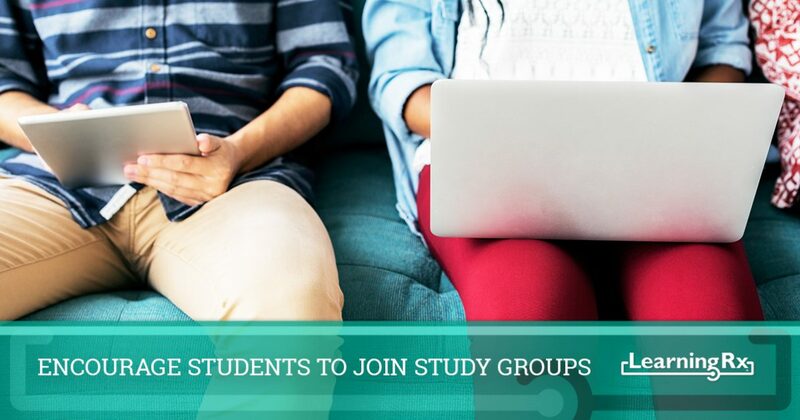 Upon joining or forming a study group, a student is allowing himself or herself to interact with other people his or her own age. If a student has been having trouble keeping up in class, having the support of classmates can go a long way in boosting his or her confidence. If a student is too shy to speak up in class, the smaller setting of a study group can provide an opportunity to voice a thought or opinion, and hopefully discover that someone else agrees or feels the same way. The students in a study group can not only bolster each other’s confidence and build relationships, but they can also bolster each other’s knowledge. If one student is particularly skilled or adept at a certain subject, he or she can share knowledge that benefits the entire group. Instead of just one student achieving greater academic success, the entire group enjoys it! Also, if one student is attending brain training sessions and has found it to be beneficial, he or she can encourage the others to do so as well. If you’re interested in learning more about our brain training and educational franchise opportunities, please contact us today. We’ve helped people all across the country and with all types of backgrounds discover just how great opening a local learning center can be. If you have the drive to succeed and a passion for working with students of all ages, then we believe that you can be successful. To get started, simply fill out the form below and a member of our team will respond as soon as possible. Be sure to also take a look at our Events page for details on upcoming webinars, Discovery Days, and training sessions. With the right approach, you could be working with students and helping them find study groups very soon!